Z2 always wants to "do school". He generally wants to do anything Z1 does because that's his big brother! Z2 is only three and so there's not much to his schooling. Initially I was just doing play-dough and playing flash-card games with him but one day at work, I noticed a book in the garbage. I took it out because it looked relatively new--and it was. It was a pre-school Handwriting without Tears book and only a few pages had been done. I do the Handwriting without Tears program at work and I really like it. It's a consistent, methodological, multi-sensory approach to handwriting developed by an occupational therapist. My students are work really enjoy it, it's easy to do, and it's really effective. So when I found the book half used, I took it and decided to use it for Z2. Why not implement the program at home? Not only is it good for helping Z2 develop his motor skills/writing, it's a wonderful review of letters and their sounds. So this is what I've been using to "do school" with Z2 and it's working out well. I don't do all the HWT steps. I have the slate board for Wet-Dry-Try (but I didn't buy the sponges--I just cut up my own and I didn't buy the chalk). I also roll out letters with the dough (Z2 finds this very challenging). I purchased the flip crayons which is what we use to write in the preschool workbook. They are just brilliant. I must say, Z2's grip is right on point (tripod grip is ideal for writing) and he enjoys doing his "work". I use the HWT program in conjunction with the Brainquest Preschool workbook. I don't love this workbook but it's colorful and fun and Z2 likes having his own book. I purchased it at Costco for about $7 so I'm not too mad. I also broke out the Hooked on Phonics tapes but Z2 is a different child and does not seem willing to abide all the repetition. I also use HWT for Z1. He's using the first grade workbook now and we really don't do anything except practice in the workbook. We were using the blackboard with double lines and all the steps but he's really comfortable writing now and knows how to form his letters. His handwriting is very nice and so I have no reservations recommending the HWT programs both for younger and older students. We may use the HWT program for cursive but I can't say I'm crazy the HWT cursive style although the one pro to it is that it's very readable. You can download guides and extra resources too! At my job, as part of the critical thinking portion of the math program, we have the kids do something similar to tangrams (they actually use pattern blocks). I think it's a great and fun thinking tool. 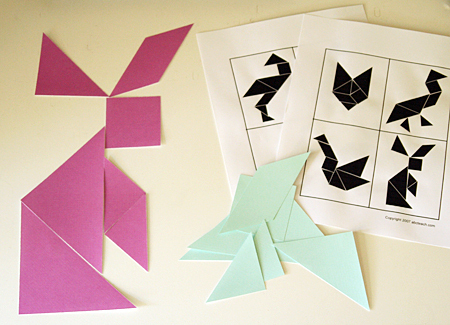 Here's some history on tangram puzzles. Tangram puzzles really work out your mind and force you to think in different ways. After someone mentioned on Facebook that their child was working with pattern blocks, I was motivated to give tangrams a try myself. We did some puzzles online but we were getting rather frustrated so I went in search of a tangram set--something we could touch and move around with our fingers. I discovered Classic Tangoes, a quality game with lots of puzzle cards (and solutions). It comes in a very compact case and we really have a good time figuring out the puzzles--or at least trying. Most of the time, we give up and "cheat" but even after we look at the solution, we're always fascinated by how the puzzle is solved. Heck, even putting the pieces back in the case is a challenge. Another game I discovered is the Think Fun Block (interestingly enough, this game is used at my job too). I didn't buy it but it's on my wish list. I love these games that are challenging and not electronic! And I'm very excited because here is a great way to learn about math that feels just like playing. I will print out some simple tangram block templates for Z2 now that I think about it . . . he always wants to play with the tangrams but doesn't know how. He really enjoys puzzles and this is a great way to get him involved! Science, science, science . . . I am really having a difficult time incorporating science learning in a consistent way. So far, I've just been following Z1's cues. Over the past couple of months, we've studied seasons, what makes day and night, and bats. I'm not using any curriculum: we've just been borrowing books and using online resources (like Lesson Pathways). Anyway, I'd like to become more consistent about it and I'm looking for ideas. We don't really do experiments and I'm trying to figure out why I'm not more enthusiastic about it. I've borrowed Mudpies to Magnets about two different times and I still can't get into it. I discovered Supercharged Science and while I like what I see on there, the price is just completely out of the question. This book, Real Science 4 Kids might have something but I am just loathe to put out more money. I can't say I had a really good science education (up until I got to high school) and I'd like to offer that to Z1 but I feel kind of limited and unenthusiastic about it. I really don't want to pass that on. But I think that for the rest of this kindergarten year, I'll just keep doing what I've been doing (but being more consistent) and then maybe come summer, we'll become members at the Liberty Science Center and that might spark something in both Z1 and I. I'm also trying to remember that he's in kindergarten and I'm sure that as time goes on, I'll be able to enroll him in science programs offered by the various parks, recreation departments, and nature centers. Just recently, we participated in a program at Westmoreland Sanctuary where we learned about birds and made a bird feeder. We're having an awesome time watching birds feed at the feeder and it's amazing how much information we picked up about birds just by participating. So I guess somewhere deep inside I really believe we'll learn about science in a natural and un-forced kind of way because truly, it's all around us. We keep our eyes and ears open, take advantage of so much of the still-wild spaces we have around us by going on hikes and supporting our nature centers and we'll learn plenty. After all, we started talking about night and day when Z1 noticed that it was pitch black by the time it was dinner time. We got into bats because he was using the computers at the library and the program introduced him to Stellaluna (a beautiful book by the way). I also think I can reasonably commit to one science experiment or activity a month. Nothing too ambitious. Just some activity related to what we're doing or experiencing. By the time the boys get to high school and need to learn the more complex, knitty-gritty science, I think we'll be able to utilize our local community colleges. I gave up on Right Start . . . I haven't been able to keep up with this blog like I would to. (((sigh))) I haven't given up on it but I have given up on Right Start Math. I purchased Math-U-See which is the one I had originally felt moved to buy and boy am I glad I did I finally did it even though I had to sink a big chunk of change. Lesson learned: follow your gut. For me, Right Start Math was just not a good fit. First of all, I had to do more preparation than I was willing to in order to begin each lesson. Photocopies. Cutting stuff up. Taping stuff together. Oh goodness. With Math-U-See, I just jump right into the lesson. Sometimes I read the teacher's manual. Other times, Z1 and I just watch the instructional DVD together. I love how simple and straightforward this program is. I like how it's ordered. Every lesson seems to naturally flow into the next. It makes sense to me in a way that Right Start was not. Don't get me wrong: I'm happy to have tried Right Start though . . . I think there's some value in learning math with an abacus although I have to honestly say that learning with the blocks just makes much more sense to me and to Z1. What I did really like about Right Start though was how it threw in things that weren't necessarily related to the topic at hand like the meaning of parallel and perpendicular lines and identification of quadrilaterals. But since I trust Math-U-See (because it makes sense to me), I know we'll eventually cover everything. So we are both very happy with Math-U-See. Actually, thrilled with it. Another program we've been using is IXL: Math for the Left and the Right Brain. I *really* like this site a lot. It provides lots of extra practice for things we're covering in Math-U-See but Z1 also clicks around and tries all different kinds of things. I enjoy sitting with him and working on it. It's self-correcting and Z1 is motivated to keep going in order to get ribbons and other prizes. Plus we get an e-mail report about what he's been doing. We had a free trial membership through our homeschooling co-op and there's a big possibility that all members will be able to get a heavily discounted membership which would be wonderful because I'd actually pay full price for it. Z1 used his pointer finger to "write" the letters that make certain sounds on this baggie So, for example, I would dictate the sound "s" or "ch" and he'd "write" the corresponding letter(s) on it. He loves how the "goo" feels. I have to admit, so do I. It's kind of relaxing. I'm going to do the same thing with some shaving cream as soon as I can get to the dollar store to buy some cheap shaving cream. In my last post I was struggling with the Right Start Math curriculum but I'm sticking with it. Today's lesson (working with 10s) was actually pretty interesting so I'm encouraged. Aside from that, we just started the All About Spelling program level 1. It will be really easy for Z1 since we've covered much of the material (syllables and vowels/consonants) but I'm hoping it'll build his confidence and fill some gaps. Last Friday, I went down to NYCHEA's annual meeting at the ROC. It took us over an hour on the train to get down there. And then when we got down there, I realized that I could not fully participate since Z2 is just a touch too young to hang out independently with other children (he still hits and bites on occasion) but he is too old (and disruptive) to have stayed quietly in the meeting room. So I didn't garner much from the meeting at all. One thing I did hear a little bit more about was the Charlotte Mason method and I'm going to try to get some more information on it. (Currently, my lean is toward classical homeschooling in the vein of The Well-Trained Mind.) What I learned from the whole exhausting experience was that it is just not the time. I have been struggling so hard to get us involved in groups and trying to get us doing things with other homeschoolers. I have been repeatedly frustrated. I am now accepting that when the time comes, building our community and getting the support I need will be simple. It won't be exhausting. It won't be frustrating or stressful. As with everything else, I'm learning to be right here, right now. On a different note, it was so exciting today! At the library program we go to regularly on Tuesdays, they introduced a new thing. We can now borrow bags full of materials (puzzles, coloring pages, puppets, books, etc.) all focused on a particular theme. The theme of the bag we borrowed this week is "Community Helpers" which is awesome because one of the aims for first grade is learning about . . . you guessed it community helpers! So that was a wonderful discovery! And I'm reminded that for all the things I don't have, there are many things I do. So I'm grateful! So I'm feeling very positive about things right now. Already learning . . . I took the huge risk of purchasing the Right Start math curriculum for almost $200. I wanted something that would be fun, interactive and hands-on while providing a rock-solid mathematics foundations. It's extremely important to me that the boys develop a deep understanding of math--not just learning what to do and doing it. I what them to really comprehend why they are doing things. I think the program is wonderful in that regard but I find it tedious and dry. Except for the games, there really is nothing fun about it and the materials are really drab. I understood it was a risk. At this point, I kind of wish I had gone with the Math-u-See program like I was going to initially. But I'm not purchasing anything else for this school year. I have spent about $275 on curricula this year: Right Start and All About Spelling and that's my limit. I would rather spend money on museums or classes than on curricula. So, I'm going to make do with the Right Start math for this year, look into doing Math Mammoth (the free worksheets) and continue to use the School Zone Math 1-2 book I purchased some time ago. I'm not sure about purchasing math curricula in the future. I may give Math-u-See a try but that's really about it. I have decided to read (and perhaps purchase) Knowing and Teaching Elementary Mathematics to help me become more confident as a math teacher. I will probably cobble together my own curriculum using many resources. We really don't have money to waste and so I will have to be more self-sufficient in regards to curricula. We are an African-American family who homeschools. We hope to give our two beautiful brown boys a solid educational foundation. We want them to be analytical and critical thinkers and enjoy learning. More importantly, we want them to be lifelong learners. I'm Chi-Chi and I write this blog. I am primarily responsible for their day-to-day learning so I started this blog to keep a record of my thoughts on homeschooling and also their progress.